Pre-workoutPeak Plutonium - 1000g + 50 kaps. Peak Plutonium - 1000g + 50 kaps. Package: 1000g + 50 kaps. 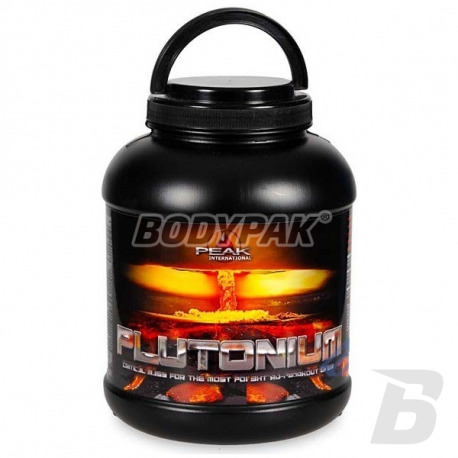 Plutonium - provides everything that causes expansion of your cells to the limit. Your muscles will be buried nutrients, additionally you will experience incredible muscle pumps. 324 loyalty points Your cart will total 324 points that can be converted into a voucher of 12,96 PLN. Thanks to all types of arginine and arginine precursors, 8 Malat, Norvaline, Quercetin, baldness and Ginko Biloba and Rutin, Plutonium provides everything that causes expansion of your cells to the limit. Your muscles will be buried nutrients, additionally you will experience incredible muscle pumps. 15 types of creatine and additional exceptional ingredients result in an incredible increase in muscle mass and strength. A revolutionary combination of different BCAA (Ethyl Ester Malate, Alpha-ketoglutarate and N-Acethyl BCAA) allows for incredibly fast inflow of how important amino acids to your muscle cells. BCAA bring you in an anabolic state and protect your muscles against catabolism. Synergistic Multimatrix containing the strongest stimulants like caffeine, taurine, Alpha-ketoglutarate and mikrozynowana taurine, glucuronolactone, ribose, HMB, Guarana, Ginger, Ginseng, TMG, MCT-and Waxy Maize Starch increases your energy level and your concentration. 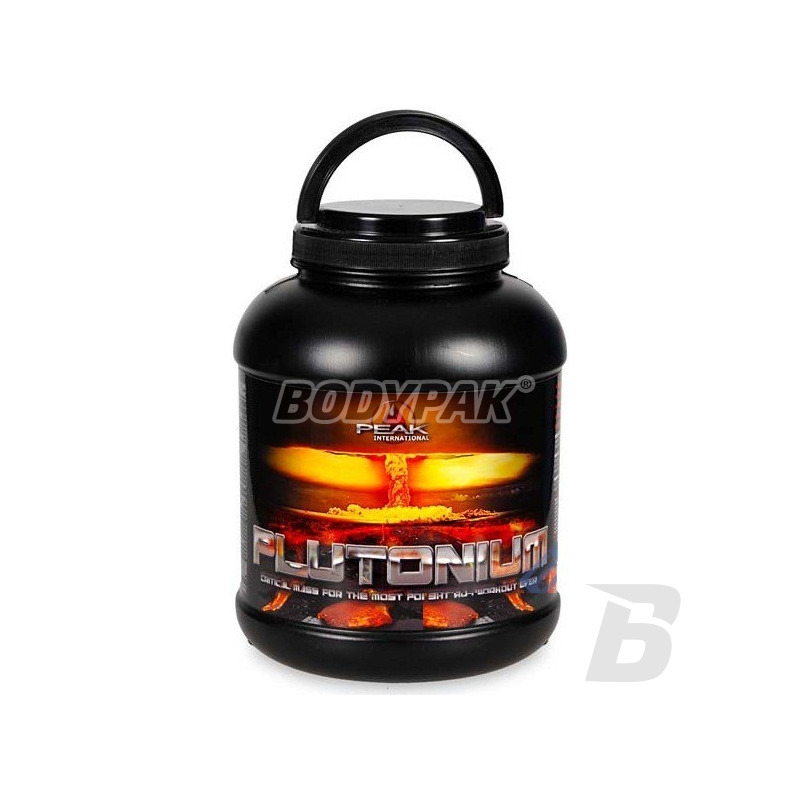 Peak Plutonium also contains 3 kinds of L-carnitine (ALCAR, gplc and-Carnitine Tartrate), two types of tyrosine, Capsaicin, White-Willow Bark, Choline and Inositol-bitartrate. This set of hellish burn your fat! ANABOLMATRIX containing steroidal saponins, Tribulus terrestris, Maca, Fenugreek, MHCP (Cinnamon), HCA, 4-Hydroxy-Isoleucine and Glycine max stimulates your hormones, in particular testosterone, HGH, IGF-1 and insulin. This will lead to mega-growth of your muscles. Ergogene Matrix with the strongest antyoxydantami Alpha Liponsaure, EGCG from Gruntee, OPC of Grape-Seed, cysteine ​​(NAC), Carnosin and many others, destroy all the free radicals that attack your body. 38g powder (2 scoops - 1 serving) dissolved in 400-500ml of cold water; to each portion of the drink Swallow 2 capsules included. Conditioner is best used on an empty stomach, ok.30min. before training. Warning !!! Beginners athletes is recommended to use ½ serving (1 scoop) + 1 capsule. Packing: 1000g + 50 caps.